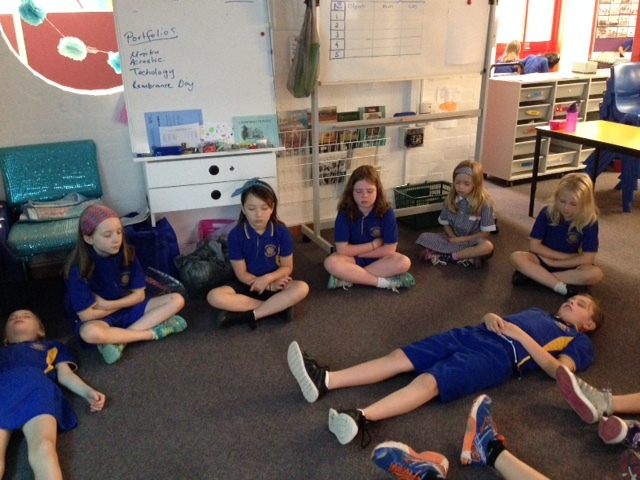 Giralang Primary students practising mindfulness. Photo: Supplied. A mindfulness meditation program should be rolled out across ACT primary schools as a proactive and inexpensive way to improve student wellbeing and prevent bullying and violence, the ACT Parents and Citizens Association says. In a 2019 Budget submission, the Association says a recent trial of mindfulness for Year 3 students at Giralang Primary School in the ACT had been so successful that it had been extended to the whole school. It says the trial demonstrated a 95 per cent reduction in the negative behaviour of students, including violence, as well as contributing to a more settled classroom and better concentration, productivity and self-regulation. The trial drew on the Smiling Mind program, which included teacher training at a cost of $1500 per workshop, with free manuals and resources. Giralang parent Jennifer Sexton, who has trained in mindfulness, had been arguing the benefits of the practice to the school for some time but the turning point came in 2015 with the arrival of new principal Belinda Love who saw a Year 3 class in need of help. Ms Sexton helped set up the trial and collected data, using the internationally recognised Strength and Difficulty Questionaire (SDQ) process which provides a mental health risk scale. The daily practice started with five minutes, gradually building up to the current 10-15 minutes within an allotted half-hour period. “The results were fantastic. I think we were all quite blown away,” she said. Since then, with the whole school (including teachers) practising mindfulness, teachers are reporting that classrooms are more settled, students’ work output greater after mindfulness practice, and parents reporting better satisfaction with the school’s management of student behaviour. Ms Sexton says mindfulness is now part of the Giralang’s five-year strategic plan, and the principal believes it is critical in the future education of children. She said the mother of a child with autism had thanked her for setting up the trial because it had made such an enormous difference to him. There had been some resistance from a couple of parents who practised their own form of church-based meditation but as the benefits became clear it was evident that this was a mental health strategy and nothing to do with religion. She said starting with primary school was an early intervention strategy but it should also be introduced in high schools where mental health issues, including suicide, are causing increasing concern. ACT Parents and Citizens Association spokesperson Janelle Kennard said there had been strong support for the mindfulness proposal at meetings. “Given the context that there are parents in many schools who are concerned about negative behaviour and violence, if it really does address some of the underlying issues, yes parents would be more than happy to embrace it,” she said. The Association wanted to see it more systematically rolled out across Canberra recommending a 10-primary school trial for Class 3 students over 12 months. The cost would be about $52,909, or around $1000 a week, including two 90-minute workshops with teachers from Smiling Mind ($1500 per workshop) and research using the free SDQ assessment tool. The main costs would entail paying a researcher to carry out data collection, data entry, analysis and report compilation, and project management. Ms Sexton said these costs were miniscule compared with the millions of dollars education departments would spend dealing with behavioural issues and the growing mental health problem. The Mindfulness in ACT primary schools proposal is supported by Headspace ACT; Thomas Nielsen PhD, Associate Professor in Education, University of Canberra; and former senator Katy Gallagher. Sounds like a way for consultants to earn a truckload of public money. Mindfulness in itself is fantastic. It should be part of the curriculum, both for its immediate effect in enhancing learning and behaviour in schools, and for its longer life benefits. But need it be so expensive? Alex Cobb interesting research on mindfulness in primary schools. They also use the SDQ. Thought it might interest you and the team xo - I couldn’t tag Jo for some reason. Melanie Kinney Sinton - thought you would smile seeing this article.